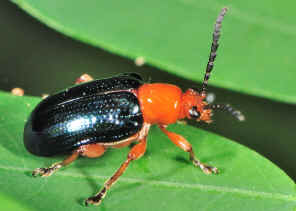 This page contains pictures and information about Narrow-necked Leaf beetles that we found in the Brisbane area, Queensland, Australia. 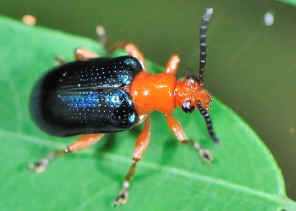 The leaf beetles in subfamily Criocerinae have the narrow thorax, so the common name Narrow-necked Leaf Beetle. 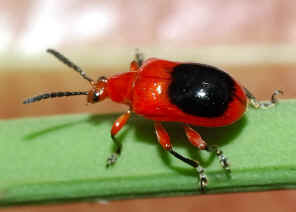 This leaf beetle is bright red in colour with a large black spots on the back. We found the beetle a few time on this same host plants in Karawatha forest, which the plant had not been identified yet. More information and pictures can be found in this page. 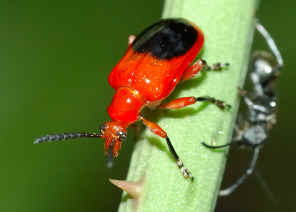 This leaf beetle is bright pale green in colour with a half black on the back. We found this leaf beetle once on the same host plant where we also found the Red Narrow-necked Leaf beetle (above) at the same time. We thought they are the same species. Chris Reid send us email and advised that it is the Lilioceris chamelus which is rare. 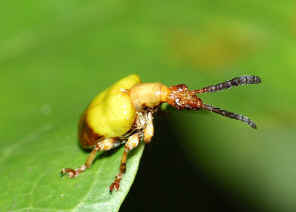 We found this Narrow-necked Leaf Beetle in Ford Road Conservation Area on Mar 2011. The beetle was flying. 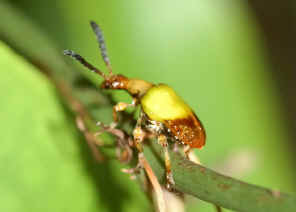 We followed the flying beetle and took those pictures when it rested on leaf. Please check this page for more pictures and information. 1. Leaf Beetles subfamily Criocerinae - lifeunseen.com, by Nick Monaghan, 2008. 2. Beetles of Australia - Trevor J Hawkeswood, Angus & Robertson Publishers, 1987, plate 151. 3. Lilioceris (Lilioceris) bakewelli (Baly, 1859) - Australian Biological Resources Study, Department of the Environment and Heritage, Australia 2005.